Independence is a conquest; one must acquire it physically, emotionally, and psychologically. Freedom can be attained with independence with discipline and responsibility. The more the child can explore his environment with confidence, the more he can master developmental tasks and establish new skills which help to support his widening sense of independence. In order to achieve independence, an individual must work towards the fulfillment of his own potential. A person must be able to realistically judge his own abilities and limitations and become truly free within the community to which he belongs. With the material inside the classroom, there is opportunity with freedom, with limitations, of course. Cooperation with other members of the child’s community (adults and children), respect their need for independence is also very important to develop. In the ages 0-3 years, the child has an unconscious absorbent mind, whereas 3-6 years-olds have a conscious absorbent mind. During his sensitive periods, the formation of his ego begins at this time as well as the creation of his mental faculties such as memory, order, will, reason, intellectual thought, and mental structure. You may notice the child asks a lot of “what” questions. When answering the child a lot of vocabulary should be used to broaden his horizons to new words. What the child sees is what he believes as imagination does not exist at this age just yet. If is not right in front of him he will not see it in his mind or understand it. To help the development of independence in each child is our job as adults and parents. Trusting that your child can do it by him/herself is key. Take the time to make time for the challenges that can come across like putting on his/her own shoes, pulling up their own pants, putting their own toys away, etc. Be conscious not to "hover" by being patient and pointing out what they did correctly or with intent and purpose rather then what they missed or did wrong. This is vital to their continued success and motivation. Through our consistency, we help our child be more independent every day. Pouring their own water helps with hand-eye coordination and development of independence. Brushing off hands after falling and reassuring they will be alright helps become self-aware in their injury. The children have a library area available to sit and take a look at a book on their own. Children taking care of their environment helps aiding the needs of our classroom and that use it. The children set out utensils for lunch and put them away after they have been washed. Food preparation is done to share a snack with the other children during lunch; this aids independence and care for others in he environment. Every child has the opportunity of pouring milk and serving it to all the children for lunch; this aids the child's development of independence. Children pour their own water from a pitcher to their own water cup to aid independence. Every child serves their own snack every morning. 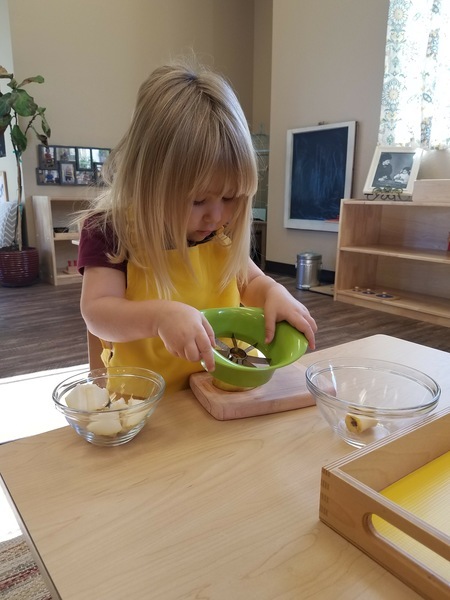 Tongs and spoons help with serving to help develop their hand grasping. Mopping helps take care of the floors in the environment; reassuring the cleanliness and safety to our environment. Putting shoes on their own helps in aiding development of independence. They become self-aware on how to take care of their needs. Helping fill the water pitcher for everyone to have a chance to drink water. In the environment, we show washing the table when a table is dirty. This helps with becoming self-aware of the environment and its needs too. 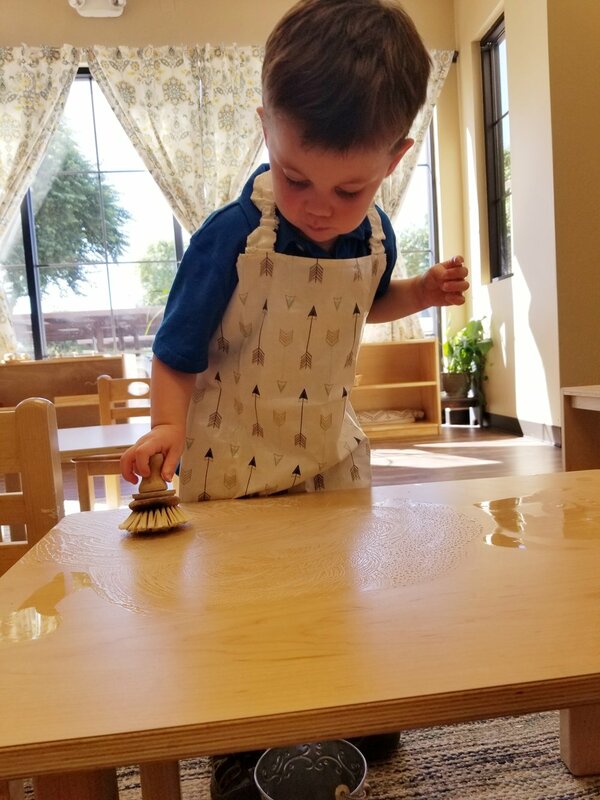 Water is poured on their own at a table while sitting down to aid in their balance, hand-eye coordination and develop independence. A brush and dustpan are available to sweep up after snack. This helps the child develop self-awareness and becoming aware of the environment.